Cheese soufflés are the stuff dreams are made of! Pair them with a healthy apple, walnut and pomegranate salad and you have the perfectly balanced dish. This recipe is worth saving to pass down to your future generations because not only is it easy to make but also equally delicious. We are glad Chef Akhilesh Jha of Fresc Co, New Delhi shared it with us. * Pour the milk into a saucepan and warm gently over low heat to take the chill off it. Sift the flour into the milk and mix well. * Cook on moderate heat until you can no longer taste the flour in the mixture and there are no lumps. Remove from the heat and beat in the butter. * Beat the egg yolks into the mixture, then add the cheddar and chopped chives. Season with salt and pepper. * Grease the four moulds/ramekins with softened butter and coat the insides with grated Parmesan. * Whisk the egg whites in a bowl until you have firm peaks. Carefully fold the egg whites into the cheese sauce, taking care not to deflate them by overworking or being too heavy handed. * Spoon the mixture into the moulds and cook in a steamer for 12 mins. When cooked, remove from the steamer and leave to stand for 10 mins or until they are cool enough to handle. * Remove the soufflés from the moulds. At this stage, you can either put them in the fridge until needed or cook straight away. * To cook, preheat the oven to 200 degree celsius. Put the soufflés on a baking tray lined with greaseproof paper and bake for 6–8 mins. 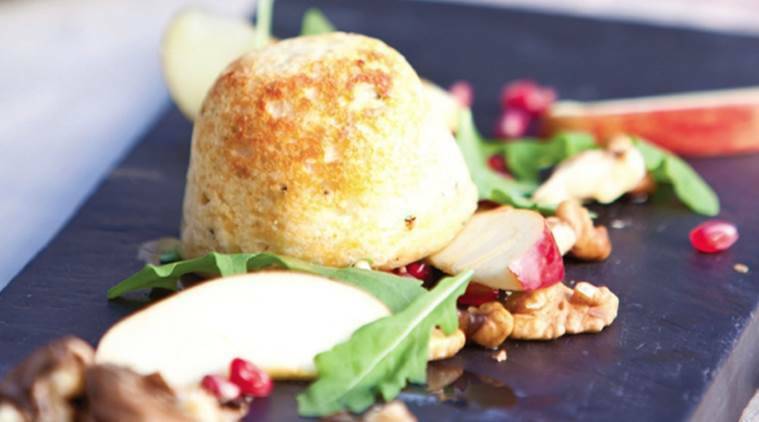 * To serve, arrange the apple on four small plates with the walnuts, rocket and pomegranate seeds scattered over. Remove the soufflés from the oven and place straight onto the salad. Drizzle with walnut oil and serve straight away.